Let us remember that it is not only when we are driving a beginner or expert. “Driving is dangerous activity”, (this paper is always in the vehicle manual book if we’ve read). This means that in any condition as long as we are driving, we must always guard against and in standby mode. Because of the potential danger to yourself or other road users always there. Only the degree of danger depending on various conditions that can trigger the danger itself. So driving is relaxed it never existed. Almost all driving instuctur never advised us to relax while driving. Relaxed conditions we usually own improvisation of our confidence in our ability to drive. Try to remember when we first learned to drive Sure we concentrate fill it. but by the time we felt it was good at, we even tend to underestimate. Why? Though the possibility of danger remains the same. 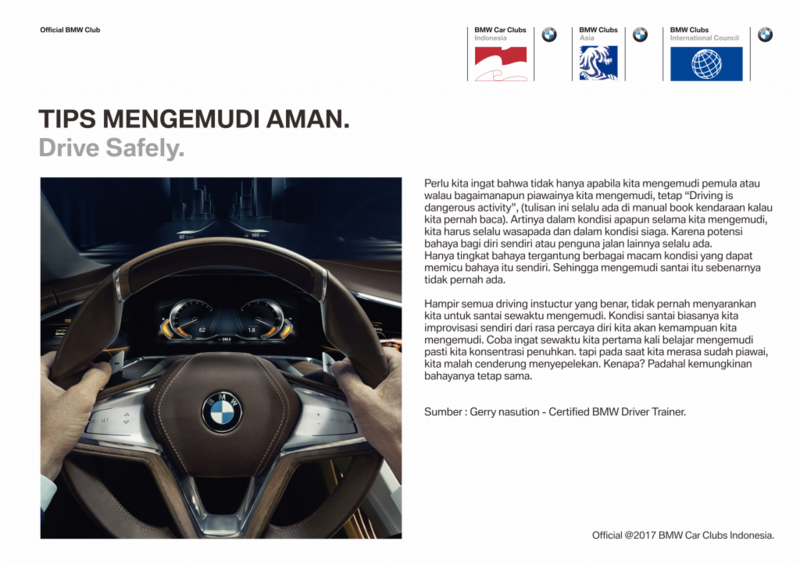 Source: Gerry Nasution – Certified BMW Driver Trainer. Official @2017 BMW Car Clusb Indonesia.